Have you heard of the Magnus Collective? This is a very ambitious company that is mixing artificial intelligence and blockchain. Our blog is going to review this company today. The Magnus Collective is the self-entitled “world’s first robotics and A.I. automation token”. This company has created a cryptocurrency which is backed by an “army of robots”. The token captures the value of many robots worldwide. Because of this, it will be a currency that will always be very valuable. The company believes that both artificial intelligence and the blockchain technology are both technologies that are disrupting the world today and causing a revolution that will completely change the world of the future. Today, it is easier to use robots and to have access to the blockchain tech to do whatever you want. The Magnus Collective believes in a society that has collaboration between artificial intelligence and humans to achieve great new highs. The company is focused on creating an AI-backed blockchain technology exactly because it believes that the AI technology is the future of mankind. The company has partners like Johnson & Johnson, Pfizer, Boehringer, AScension, Siemens, Nokia, among others. 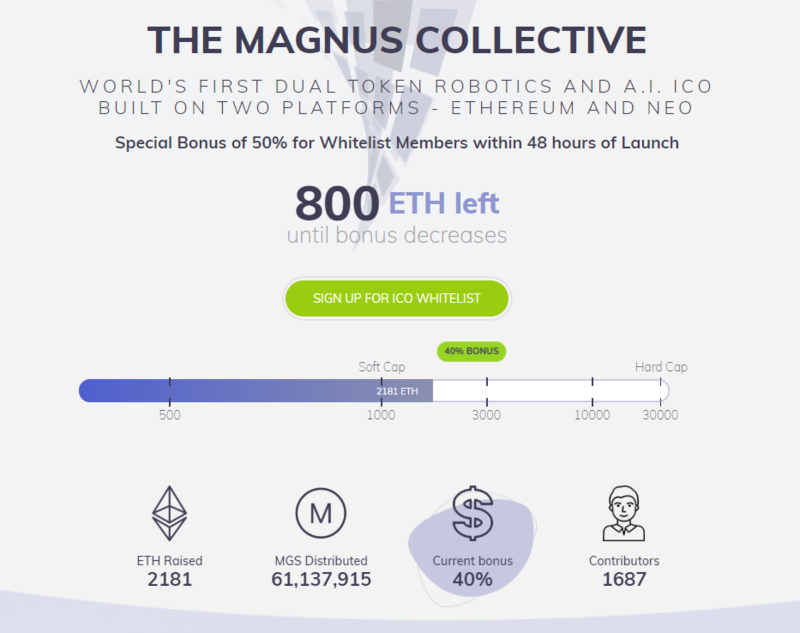 Basically, you will be able to use the Magnus Collective tokens as you would use any other token. It will have a certain value and you would use it to pay for services and goods, as usual. The biggest difference is that the price of the token is backed by investments in robotics, not only the market. You will also be able to use your tokens for staking. This way, you will receive a share of the transaction fees that are paid when people use the token to buy something. Unlike Bitcoin, on the other hand, you will not be able to mine Magnus Tokens because it uses a proof-of-stake blockchain instead of a proof-of-work one. How To Invest In Magnus MGS ICO? If you are hyped about the idea of investing in the Magnus Collective, know that you can do that by participating in the Initial Coin Offering (ICO) and buying tokens from the company. The first phase of the ICO, the pre-sale, will start on February 5. The main ICO will begin soon after, on February 15. The price per token will 1 Magnus Token for $0.66 USD, but you may have bonuses if you buy during the pre-sale. The pre-ICO will have a hard cap of 6000 Ether and the main ICO’s hard cap will be 30,000 Ether. The remaining tokens will be burned after the ICO. All unsold tokens will be burned after the end of the ICO. Magnus Collective totals at the time of writing (February 7th, 2018). Magnus Collective’s social media reach is quite impressive for a start-up ICO. It should be able to gain further traction easier from this point on. Is this company a good investment for you? If you believe in the power of the artificial intelligence, yes. The company seems to be backed by very powerful companies and it has plenty of chances to actually get good results there. AI will probably improve a lot in the future and so will the value of this company and its tokens. The Magnus Collective might be a good long-term investment for you because there is the chance that this company will offer a good return on investment for you but in the future. If you have enough patience, it could be a good idea to invest in this company.